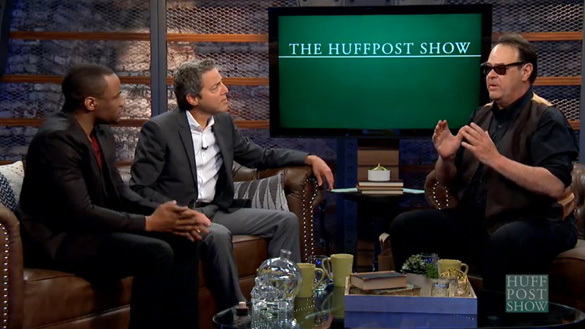 The HuffPost Show is hosted by founding editor of The Huffington Post Roy Sekoff and former professor and veteran HuffPost Live host Marc Lamont Hill. The show is a new weekly news magazine style show, and the third episode, featuring a long interview with Aykroyd (the interview can be seen here), was aired online on Friday. Although Aykroyd says the Air Force does not deny the existence of alien spacecraft, he explains why he thinks there is a cover-up of that information. Hill then asked Aykroyd if he was willing to share more information about the UFOs he had seen. 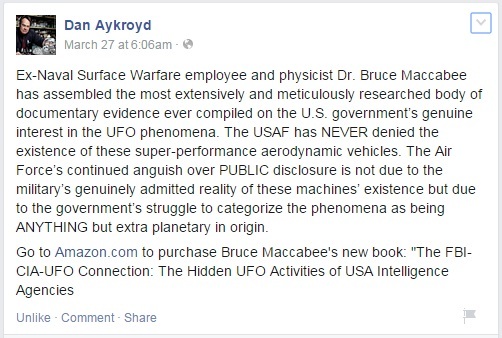 Aykroyd also recommended a book about UFOs and the CIA and FBI by Dr. Bruce Maccabee. The book is titled, The FBI-CIA-UFO Connection: The Hidden UFO Activities of USA Intelligence Agencies, and it reviews documents that Maccabee received via the Freedom of Information Act. Maccabee, a physicist, spent thirty-six years at the Naval Surface Warfare Center. Aykroyd can be seen talking about his UFO beliefs for two hours straight on a video titled Dan Aykroyd Unplugged on UFOs. OpenMinds.tv was also able to catch up with Aykroyd a few years in Scottsdale, Arizona at a BevMo liquor store where he was promoting his Crystal Head Vodka. A topic that was also discussed on The HuffPost Show. A bottle of his vodka can be seen on the coffee table on the set. Maybe they are just explorers like Columbus. 70,000 mph whip turns! How cool! Scared of dat! Grew up with a family that worked at NASA for all of the Apollo missions.. we lived it.. they let us out of school to go see the launches.. my father and grandfather told stories all the time about the things they heard when they picked up the phones all throughout the VAB.. you could hear the astronauts on back channels and they would talk clearly about the sightings of unexplained craft looked like and the maneuvers they would make. I remember them talking about filming I dream of Jeannie down there some.. I think the jetpack flying device was used often during the Apollo era and that was always fun to hear about. I guess those aliens hovering over Mr. Aykroyd were continuing the viewing they must have enjoyed of all the cinema he has made over these years. I’ve watched everything Dan has made when it came out fresh and it all still plays great to the soul and laughter that can’t be stifled. Hope he has one saved for Bill Murray still.. if I was an alien I would want to watch Aykroyd lol if I could hover over his head and fly off at 70,000 mph doing flip flop turns! I believe, because it is true. He’s wearing sunglasses indoors! Hmmmmmm……have a few drinks this morning Dan? So he’s not talking about his ‘ufo dream summons’ any more? That’s encouraging, because it was pretty imaginary. Stories, stories, stories, never proof. Ufoolery at its best. Dan said that the Mexican UFOs were explained away as “swamp gas”…not true! They were explained away as oil platforms in the gulf region. Wilson: “you could hear the astronauts on back channels and they would talk clearly about the sightings of unexplained craft looked like and the maneuvers they would make”. Fascinating folklore, for sure — any checkable details? How come nobody in Houston seems to have ever heard such conversations? having never seen a UFO it is definitely not my place to criticise. I have no doubt people have seen stuff that is hard to explain. what troubles me is the certainty around facts in some stories. for example here the Hight the object was at. the assertion the object was 100,000 feet up. that is 30km up. an airliner at 10-12 km up is a tiny dot. so anything visible at 30km is likely to be larger than 100 meters to be visible to the naked eye. where is the certainty coming from that it is 30 km high? why not a 50meter object, at 15km up, or a 10 meter object at 3km up? UFO by definition refers to uncertainty, something unknown to the observer. Whenever people make up facts surrounding this it stops it being credible. Before going public with something maybe revisit you experience and question it, and compare and contrast it. why did you think it was high up? What perceptions did you have, what gave you spatial dimensional comparison? Don’t be defensive. reasonable people and scientists will not and should not falsify your perceptual data. Just don’t make data up.